WELS rating: 4.5 stars, 59L/wash. Energy rating: 4.5 stars, 253 kWh per year. The uptake of front loading washing machines by Australian consumers has resulted in appliances that are priced just right. Built to last and quiet to operate, ASKO front loaders are the progressive alternative for stylish laundry design. The minimalist Scandinavian appeal of impressive functionality concealed beneath seamless, smooth lines makes a powerful statement in any home. The ASKO W2084C.W.AU provides an intense wash while still retaining the best environmentally friendly cycle available. A cleaner result without damaging clothes:Front loading washing machines don’t rely on the central agitator familiar with top load washers. Gravity assisted tumble washing of front load machines removes the potential for catching stray threads and ripping clothing, a scenario all too common with their top loading counterparts. Run fewer wash cycles: ASKO front loaders incorporate a spacious internal drum instead of using a central agitator with large rubber fins. In other words, more wash items can fit inside the machine. With a front loader, you can wash less often, saving time and offering superior results. Water and energy saving: On average, front loading washing machines use one-third the amount of water, energy and detergent. ASKO design principles are the environmentally friendly solution where you will notice savings on water, energy and shopping bills every month. Reliability: Front loaders have less parts, meaning less chance of the machine malfunctioning or breaking. The gravity-assisted tumble action provides smooth functioning efficiency as an alternative to central agitators that are tougher on washing machine hardware. 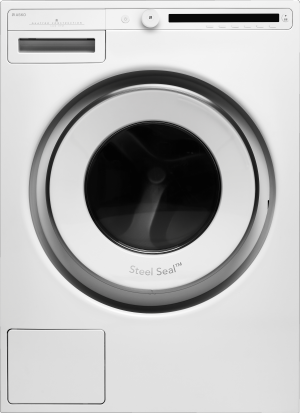 Quieter operation: ASKO front loading washing machines feature vibration control for stabilising the internal drum. The result is quiet efficiency at all times regardless of load size or spin cycle speed. The ASKO W2084C.W.AU front loading washing machine has a 1-8 kg capacity and spin speed of 1400 rpm. With a 2000 W heater capacity and 60 litre drum volume the W2084C.W.AU performance results in a 4.5 star energy rating and 4.5 star water rating. The machine weighs 77 kg, including a 10.2 kg cast iron counter weight, enhancing sturdy and stable functioning for every wash.
With noise levels of only 75dB maximum, washing and spinning goes on in the background while you enjoy peace of mind. ASKO front loading washing machines are also designed for versatility, accommodating every type of wash. Normal mode, Green mode and Intensive mode cycles mean you get to choose the appropriate wash cycle every time. With 15 programs for a personalised wash, the ASKO W2084C.W.AU is versatile, adaptable and incredibly convenient. The programs and functions are easily accessed from the high-definition control panel interface, allowing you to select the right wash cycle for every type of material. Program modes include everyday wash, cottons, wool/hand wash, dark wash and mix/synthetics. There is even a drum cleaning mode for easy maintenance. With the W2084C.W.AU your clothing remains in shape rather than in tatters, as experienced with older, less advanced appliances. ASKO W2084C.W.AU additional options include super rinse, super wash and prewash options plus adjustable spin speed. Cleanliness and health go hand-in-hand, so ASKO innovators are dedicated to creating the best appliances for Australian households. Scandinavian style never goes out of fashion, with form and function coexisting in perfect harmony. The W2084C.W.AU is seamlessly integrated from top to bottom, ensuring your appliance remains on show for everyone to appreciate. ASKO front loading washing machines are the popular choice for lots of reasons, with energy-saving capabilities a major consideration. Cutting back on utility bills also automatically provides environmentally sustainable outcomes that Australians desire. It’s estimated that traditional top-load washing machines consume around 400 kilowatt-hours of electricity per year, compared to front load machines that dramatically reduce consumption to an average of 150 kilowatt-hours per year. The reduced electricity consumption translates into savings that are appreciated with every wash, and with ASKO front loading washing machines achieving 4.5 to 5 star energy ratings, your finances are in good hands for many years to come. Major advances in laundry technology allow manufacturers to develop washing machines that multi-task. The features, programs and modes of the ASKO W2084C.W.AU front loading washing machine are all visually accessible via the illuminated LED panel, making washing a breeze. With ASKO, the interface isn’t simply an add-on for show, instead providing useable options for every type of wash at the push of a button. ASKO developers are ergonomic design specialists who create products that invite exploration, so you can easily achieve the level of washing machine functionality you desire. With ASKO on your side, washing results are guaranteed to meet all expectations.